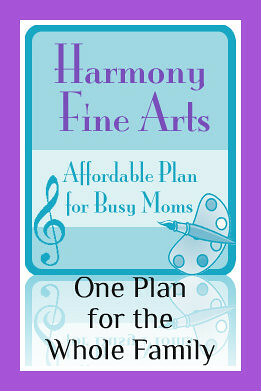 How do I use the Harmony Fine Arts plans with multiple ages of children? Here are some suggestions for making one year plan from Harmony Fine Arts work with all your children. 1. Decide which level matches your current history time period. 2. If you are new to art and music appreciation, you might consider using the lower grade. If you have had some experience or your children are older, you might consider using the upper grade. Either plan will work by adjusting how you use the three options for art. Using a lower grade with older children involved: Have the younger children stick to the plans, completing one or two of the options. Offer more options or go more in-depth to the older children, supplementing perhaps with a different Artistic Pursuits book or assigning additional paintings to study. Using an upper grade with younger children in the mix: Have the older children stick to the plans, completing at least two of the options. Have the younger children participate in Option 1 (picture study) and then any of the other activities that seem appropriate. 3. View the plans as a buffet of choices. There are three options in every year plan for art appreciation. Option 1 – Picture Study – This activity is appropriate for all ages and everyone can complete it together. Older children can add an artist biography notebook page. Option 2 – Art Appreciation with books, links, and art skills – This option is always appropriate for older children and younger children can participate when they are interested. They can listen and view books and links. They can complete coloring pages and view additional artwork as suggested. Option 3 – Depending on grade level this option includes a schedule for working through an Artistic Pursuits book or working with viewing art cards and coloring books – This is the option that will bump a lower level grade up for an older student. It is completely optional for younger children. I sometimes suggest that families substitute a different Artistic Pursuits book for the one scheduled if it will make the level more appropriate for a student. Grade 1 with older children – Complete all three options, add in artist and composer notebook pages. Grade 2 with older children – Consider substituting Artistic Pursuits Grades 4-6 Book 1 in Option 3. Grade 3 with older children – Consider substituting Artistic Pursuits Grades 4-6 Book 2 in Option 3. Grade 4 with older children – Complete all three options with additional drawing assignments for Drawing with Children. Grade 5 (Ancient) with younger children – Complete only Options 1 and 2, omitting the notebook pages. You could substitute Artistic Pursuits K-3 Book 1 in Option 3 if you wished. Grade 6 with younger children – Complete Options 1 and 2, omitting the notebook pages. Grade 7 with younger children – Complete Options 1 and 2, omitting the notebook pages. Grade 8 with younger children – Complete Options 1 and 2, omitting the notebook pages. Of course, you can always email me with your questions and family situation and I will do my best to give you some direction. I would love to help you get started with art and music appreciation in your family.